The Wiz (Jan 2011) - EVERYONE BELONGS. EVERYONE ACHIEVES. 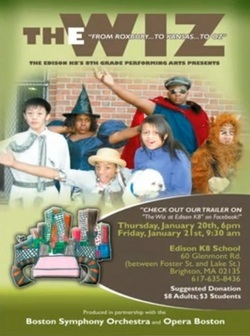 The eighth grade drama class's January 2011 production was "The Wiz," a contemporary musical based on "The Wizard of Oz." Students from some other classes also participated, such as the after-school kids who played Munchkins. The musical brought together all the performing arts at the Edison: drama, music performance, and dance. at the auditorium at the Edison K8 School, 60 Glenmont Road, Brighton, MA 02135. The video trailer can be viewed below.